Did you know you can now order your Deliveroo takeaway from Belushis here on View? Belushis is a lively bar where you can enjoy delicious cocktails and great food, and then watch a show at the upstairs Galleon Theatre all in the same place. 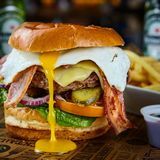 "Looking for somewhere to fuel your party, then Greenwich Belushi’s in the heart of Greenwich centre has you covered. 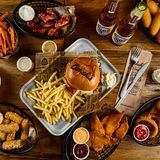 Serving up a truly awesome food menu from midday until 10pm each day, including our homemade 6oz burgers, sticky wings, a tasty selection of salads, snacks and sharing platters, we are a great hangout for lunch and dinner. We also serve up a hearty breakfast menu from 8am every day. With an epic lineup of events every night of the week, from DJ’s, live music, beer pong, student nights and for those with a guilty pleasure our legendary Rockeoke (yep, rock karaoke), you can party on until the early hours. New to our line up, we are introducing our Boozy Brunch Session every Saturday and Sunday from 11am till 3pm where we serve up a kickass brunch menu, 2 for 1 on all Absolut brunch cocktails, beer pong and loads of entertainment. What better way to mix up your snoozy Sunday afternoon, than a rockin’ daytime party with food and cocktails with friends. As the Home of International Sports in Greenwich we are also the best bar to catch all of the live sporting action from Champions League, Rugby, NFL to AFL. We showcase a massive selection across our huge full HD screens, so whatever you are looking for, head down with your mates and we’ll hook you up with a front row seat. Join us for the longest happy hour in Greenwich every day from 5-8pm. 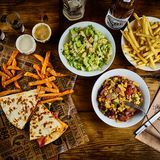 Tuck into our awesome mix of beer buckets, 2 for 1 cocktails, jugs of beer and cider plus groupie sized sharing platters for just £10. You can find us right next to the Greenwich DLR train station." By sending this booking your details will only be sent to Belushis and will never be shared with other third parties. By clicking this box you agree to the Terms and Conditions set out above. You can book to reserve an area of Belushis for you and your friends. Just enter your requirements below to see what they have to offer. What did you think of Belushis? Wow what an awesome bar! Awesome bar! Great drinks deals and staff were really cool and chatty. One girl even helped sort us a free go on the beer pong which was so much fun! Good drinks, friendly staff - very nice. I love this place, have been many times before and it is a great bar to meet up with friends and chat. The drinks are reasonably priced and it is decked out really cool with a British theme running through it. I drink with friends who live in Greenwich and this is where we always end up. I was very disappointed. I had a one month free taste card trail which gave 50% off at this place. I rang up four times and was never able to make a booking until my last call. The waitress said they accepted the tase card but I have to wait an hours time as they are busy - only to arrive an hour later with the manager refusing to accept it and saying 'it's our business we do what we want!'. They couldn't give a proper explanation of why they wouldn't accept the card and the manager look totally not bothered and rude. I would never come here again. I love this bar! Its got such a great atmosphere and the staff are super friendly. I was there last week for a comedy night and the acts were great! They also had some amazing offers on drinks and food. The burger i had was awesome! I would recommend to anyone in the area to pop in and have a relaxed pint or cocktail. Worst place I have ever been in my entire life! I am not exaggerating, the staff are rude and unhelpful, drink disgusting! Do not get ripped off by going here! great food and great value, would recommend a visit. 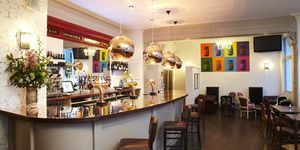 A Greenwich pub, theatre and hostel given an overhaul by trendy lightshades and arty posters, Belushis is a good place to hide from the pricey Greenwich middleclass bars. Bang next to the main Greenwich railway station and Novotel Hotel, Belushis makes sense as a bar in which to meet travelling friends. If said friends are travelling from further than New Cross - like Chile - the complex also possesses a hostel. This means you’re likely to meet lost Chilean teenagers wandering through the bar. Although the brand name isn’t necessarily synonymous with glamour, Belushis makeover isn’t half-bad on the eye. Attractive red lightshades follow the length of the bar, and the walls feature arty collages of pop posters and newspaper extracts. One wall is covered by a huge print of Brit pop grandfathers The Who. It’s unclear what the male-dominated football-following crowds and hostel-dwelling students make of its art; they’re often more interested in one of the many flat screen televisions dotted about the large room. The bar staff at Belushis are friendly enough, but the long bar and weight of custom (especially when football is on - Greenwich suffers from few Sky screens) can cause long waits for a pint. Friday and Saturday nights advertise DJs and tables are moved to make way for dancing. It’s not particularly sophisticated, it’s not self-consciously trendy, but you can find a good time if you look and drink hard enough. Standard choice, standard price, standard quality. 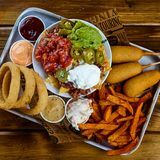 Although the menu offers tapas, further study reveals it to be small plates of potato wedges and onion rings, rather than more traditionally Spanish cuisine. That said, the burgers are of a solid, meaty quality. You come here, you drink lager. If you’re fed up with lager, you order spirit and mixers. The food menu lists some wine, but there are probably better places to quaff a vintage Merlot. Belushis is an unpretentious chain pub with a predominantly young, male crowd. A good bet for football watching or cheap boozing. 49 destinations curated by View .